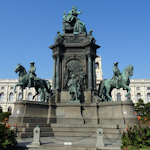 Most Habsburg emperors liked to build monuments to themselves (the Imperial equivalent of the selfie), but the one honouring the reign of Empress Maria Theresa is an exception. It was unveiled in 1888, under the rule of one of her successors, Franz Joseph. The late 19th century was a time of great construction works in Vienna, using the space freed up by the removal of the city fortifications. One of the centrepieces of those works was the area housing the “Kunsthistorisches” and “Naturhistorisches” museums, who face each other across a square now known as Maria-Theresien-Platz. A huge monument dominates the centre of this square. Unveiled in 1888, it pays tribute to the reign of Empress Maria Theresa (1717-1780), who inherited the Habsburg lands in a fairly precarious position and turned them into something rather more successful, mainly through the strength of her personality and by strategically marrying off her numerous kids (she gave birth to 16). Maria Theresa sits on a throne at the top of the monument, hand outstretched. Below her, the four riders are all military commanders with such marvellous names as Otto Ferdinand von Abensberg und Traun (Otto to his mates). Each side of the huge plinth features groups of personalities representing, respectively, her advisors, her administration, the military, and arts & science. Each side has a main character as a full statue and behind him (it was always a him), further individuals of the genre in partial relief. The side of the monument facing the Natural History Museum addresses the arts and sciences. The main figure is Gerhard van Swieten, Maria Theresa’s personal doctor, but also a key figure in the “modernisation” of medicine and medical teaching in 18th-century Vienna. Of more interest to us are the figures behind him on the relief. Above his left shoulder is Joseph Haydn, who composed a symphony for the visit of the Empress to one of the Esterházy palaces while he was employed by that family. Haydn’s hand rests on the shoulder of a young child – Mozart. The two were friends, joined in mutual respect, despite the age difference (Haydn was around 24 years older). It was Mozart, of course, who delighted the Empress as a child with a performance in Schönbrunn Palace. You can see the room it took place in on the palace tour. If you’re taking in the main sights, you’re sure to see the monument in passing, anyway. It also sits in the middle of one of the main Christmas markets: the aptly-named Weihnachtsdorf on Maria-Theresien-Platz.